Specialty: Key leader in the generation, transmission and distribution of electricity, lighting, industrial automation, medical imaging equipment, electric motors, railway & aviation products. Developed & Manufactured transistors & Diodes for use in their radio, radar & television equipment. First business in the world to own a computer. Major computer company during the 1960's, developed the Multics operating system for mainframe computers. 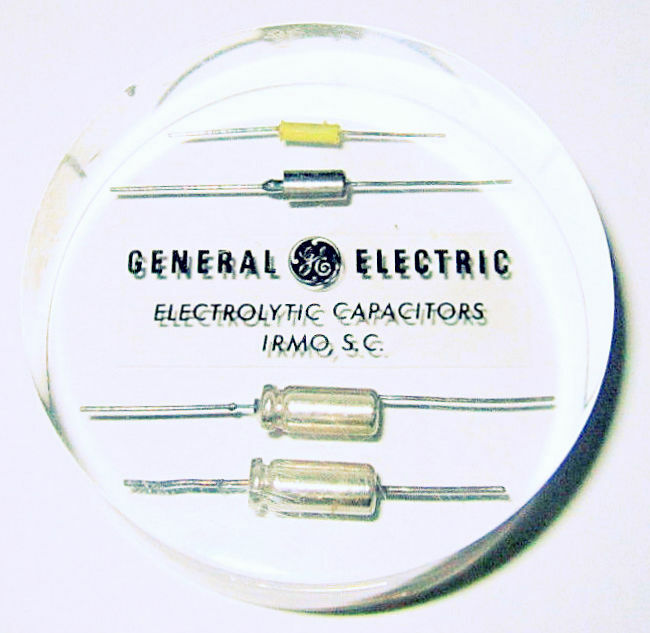 ​Lucite paperweight from GE featuring various examples of their hermetically sealed Electrolytic Capacitors manufactured at their Irmo, South Carolina plant. GE manufactured these capacitors for use in their radio and television receivers.